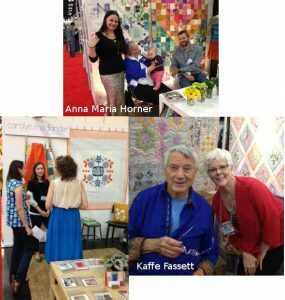 “Folks at home have been asking, “what’s your favorite thing?” It’s rude to say, “well, the quilt market is my favorite thing.” But really, that’s the truth–it’s the overall effect of many parts brought together in one glorious, colorful, magical thing–kind of like a quilt! Some elements stand out more than others, but every part is essential. And while it is a feast for the eyes, we have a job to do–to zero in on particular new patterns, notions,techniques and fabrics that we think our customers will love! A highlight of yesterday was chatting with Anna Maria Horner who visited KMIS about a year and a half ago. She has her new baby girl Mary Anna in tow, along with husband Jeff, who does Dad duty as Anna greets so many admirers and old friends, remembering all their names, gracious and warm and relaxed through it all. From there I joined Allen in the Checker booth, and as he disappeared to check on something, I chatted with a vendor from another booth. It’s her first time at this market, and this past year has brought so much personal tragedy–a little grandchild born too soon and lost only weeks ago, the near death of her daughter (the baby’s mother) loss of jobs, etc There’s more, too much to tell, so much other that you wonder how she bears it and still shows up in Houston. She didn’t unload all of this unsolicited–she seemed content to talk, so I gently asked more, and the moral of this story is that her craft gets her through it. A series of events and her husband’s support enabled her to make it to Houston in spite of the catastrophe at home, and she has been so successful that her family will have much needed income and her business will grow.